Introducing the Corsair Carbide 200R In and Around the Corsair Carbide 200R Assembling the Corsair Carbide 200R Testing Methodology Noise and Thermal Testing, Stock Noise and Thermal Testing, Overclocked Conclusion: But Why the Drive Cage? Corsair entered the enclosure business from the top with a measure of care to establish a solid brand identity. The Obsidian 800D was released as a flagship product and signalled that Corsair was serious about case design and not just looking for another revenue stream, and for the most part it was well received. Since then they've gradually trickled their designs down, with the Carbide series aimed at more frugal users. Yet the least expensive Carbide, the 300R, still runs $79 when most people would peg the price of a "budget" case as closer to $50 or $60. Enter the 200R. The Carbide 200R is the ultimate trickling down of Corsair's case line. Coming in with an MSRP of $59 and available for just $49 as of this writing, the 200R is Corsair's shot at the extreme value consumer, but this is a very tricky market to address. The balancing act of features, performance, and price becomes substantially more difficult to manage, and Corsair has a reputation to maintain. Were they able to get the price down while keeping up with their standards for ease of use and solid performance, or did they have to sacrifice too much? Corsair has historically been approaching their case (and to an extent, power supply and cooling) lines with a pretty clear philosophy of quality first, price second, which makes the 200R a very intriguing proposition. That low price point can become very restrictive in short order, and while companies like BitFenix have been able to strike an excellent balance by producing custom designs for each market, Corsair has been operating on a kind of trickle-down evolution that may not have been able to extend this far down. 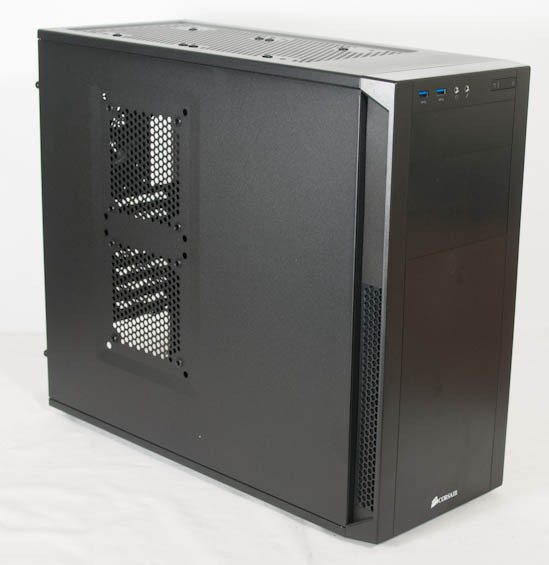 The result is a case that has a lot of familiar Corsair technology, but some newer innovations too that come with having to adapt to the low price tag. Internal 4x 2.5", 4x 3.5"
Dimensions 16.9" x 8.3" x 19.6"
As you can see, Corsair's design isn't necessarily barebones as far as features go, but it's definitely stretched. Corsair has done with they can to allow for any type of expansion the end user may want to enjoy, including higher end closed-loop liquid cooling systems. The toolless installation for 5.25", 3.5", and particularly 2.5" drives is also welcome, but you'll see later on it doesn't work quite as well as we'd like. In and Around the Corsair Carbide 200R Introducing the Corsair Carbide 200R In and Around the Corsair Carbide 200R Assembling the Corsair Carbide 200R Testing Methodology Noise and Thermal Testing, Stock Noise and Thermal Testing, Overclocked Conclusion: But Why the Drive Cage? "How many drives one changes during the lifetime of a PC?" I have a Coolermaster ATCS-200 case I bought in 2000 still kicking around the house. While it only has 80mm fans, it remains a very attractive and functional case for 'that random frankenputer' one generally has after a few years of building their own PCs. How many times have I changed the drives in that case? More times than I can remember. Some of them due to drive failures, some due to SSD / SAS experimentation, and many times for just cramming old drives in there and doing some bare metal testing of the latest silly OS that trickles down the MS TechNet vine. I still have my ACTS 200 or 201, and the next gen replacement case for it, but neither are in proper use. The motherboard tray from one is in use for a makeshift computer elsewhere where I can't use the full case. I won't buy a case with an open top. Too much chance something will spill in it, or dust will settle on my gear. Toss some sound dampening material over the fan mounts you don't intend to use; it works like a charm. The only problem, in my experience, is that the adhesive on sound dampening material is so strong that your decision is basically permanent. It's funny, I bought a box of sound dampening material, just for kicks, like seven years ago and I never used it as it was (presumably) intended to be used -- but I've used bits and pieces to great effect. And I still have some left. That said, I agree that the proliferation of computer cases featuring fan mounts in every available space is somewhat annoying -- especially given that those cases typically only come with 2 fans out of the box.